Standard tasting note disclaimers apply: these notes are not trustworthy in any way, shape, or form, because whatever, I had fun tonight. In approximate order of consumption, not necessarily how pictured. Fantôme Saison - One of my contributions, it seems that Fantôme hasn't quite emerged from their smoky, rubbery funk phase just yet, though this one wasn't quite as janky as the one I reviewed recently. It actually had more of a Saison Dupont feel, with just a bit of smoky, barnyard funk to make things interesting. I'll keep it at a B+ and pine for the lemony, sour Fantômes of yore. Dale's Pale Ale - Pretty standard fare, but excellent as such beers go. Always a good choice, and I'll hit it with a B+, just like before. Bear Republic Red Rocket Ale - Rock solid hoppy amber ale, not quite as mindblowing as some of those hoppy imperial reds, but a worthy, highly drinkable beer. Yet another B+. I swears, not everything in this post will be rated the same. Ken's Irish red Ale - Another homebrew, this time a pretty straightforward Irish Red that was made with potatoes, a pretty nice combo. Sweeter than your typical Irish Red, though it keeps that same flavor profile and works well enough. I'll go with a standard B for this one. So what I want to know is: who is Jack and why doesn't he know how to spell "Abbey"? Dear reader, I'm so sorry I haven't tackled this conundrum yet. It turns out that Jack is one of the three brothers who founded the brewery. He must be the oldest one, since he clearly got to name the brewery. So far, so normal, but then why the blatant disregard for spelling? Is Abby some sort of Ye Olde European spelling? Nope! Abby is actually Jack's wife, and he named the brewery in honor of her, presumably scoring major brownie points. Well played, Jack. Beer Nerd Details: 5.8% ABV (500 ml). Drank out of a tulip glass on 8/3/13. Bottled 5.17.2013. This exhausts my current supply of Jack's Abby. While none really made me fall down and see God, they were all pretty respectable in their own right, and represent a nice change of pace from the onslaught of saisons, stouts, and IPAs I seem to always fall back on. I'll certainly be keeping my eyes open for more of their stuff in my travels. 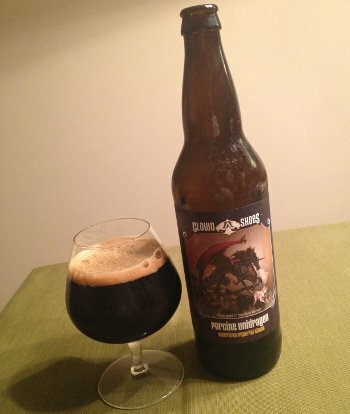 Clown Shoes Porcine Unidragon - Pours a very dark brown color with a finger of light brown head. Smells of roasted malt with some chocolate, caramel, vanilla and just a hint of bourbon. Taste again features a heavy roasted malt element (perhaps that smoke too, but it's a light touch and I don't get any porcine notes) with a bourbon kicker in the middle, a little chocolate, caramel, vanilla and oak, and that roast returning in the finish. Mouthfeel is full bodied, moderate carbonation, lots of boozy heat, and just a hint of richness. So it's retained the base beer's attributes whilst adding in a welcome dose of bourbon and oak. It's not quite perfectly integrated, but it's an improvement over the base. As it warms up, it starts to come together better. Or I'm just getting drunk here. Overall, a little unbalanced, but a really solid beer. I'll slap a B+ on it, but I do think I enjoy this more than the base (which got the same rating). 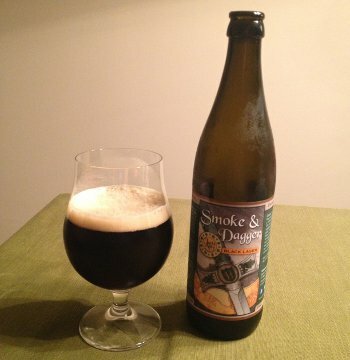 Beer Nerd Details: 12.5% ABV bottled (22 oz. bomber). Drank out of a snifter on 8/2/13. Bottled 4/17/13. Beer Nerd Details: 6.2% ABV bottled (750 ml capped). Drank out of a flute on 8/2/13. Flying Fish remains a brewery I need to become better acquainted with, especially their Exit series (of the ones I've had, they're pretty darn good). Back in college, I expended some of my few electives on Defense Against the Dark Arts classes. I did so exactly for monster beers like this, but my defensive techniques were no match for Voodoo brewery's most prized beer. Indeed, this sucker sits atop the Top New Beers list on Beer Advocate, with sky high ratings and ISOs all over the place. 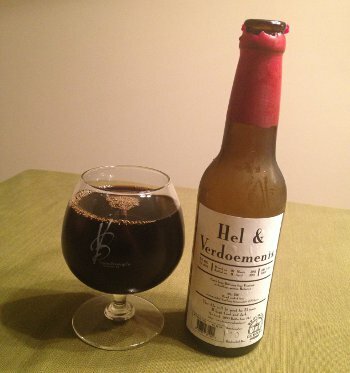 Beer Nerd Details: Somewhere around 13.5% - 15.5% ABV bottled (12 oz. red waxed cap). Drank out of Voodoo Barrel Room snifter on 7/26/13. Bottle #47, bottled 1/18/13. There was a single bottle limit on this stuff at the Philly release, but the folks at the brewery release fared a little better. Still, by my count, only 667 or so bottles were made, so I'm pretty happy I got my grubby hands on it (as well as the two other variants). The release was in April, so I'm not sure what the hell I'm waiting for. Expect some more reviews of Voodoo's barrel room collection in the coming weeks. They only make Black Magick every other year (last release was 2011), but they've got plenty of goodies in their barrel room right now and I just saw that they're doing another release in September. No details on that release yet, but I've got my fingers crossed for some BA Barleywine and Wee Heavy. Dark, strong beers seem to work best. Think World Wide Stout, which I loved at 2 years (I have since sampled a fresh pour, and yes, age does good things to this beer). Even just plain dark beers seem to do well with some time on it. I found a year old bottle of Lancaster Milk Stout in my fridge last fall and hot damn, that stuff was absolutely fantastic - smooth and creamy, just perfect (presumably similar results with the likes of other Milk Stouts like Left Hand's or Coffeehouse Stout). 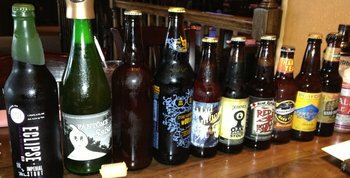 Barrel Aged beers seem to be a mixed bag. One thing that tends to kill me on this is a distinct lack of carbonation that I'm not always sure I can blame on the age. For example, Dock Street's BA Prince Myshkin RIS and BA Barleywine both had utterly fantastic barrel aged qualities, but they were nearly flat, and that's a problem for me (some folks seem to be fine with still beer, so good on them). Hoppin Frog's Barrel Aged B.O.R.I.S. suffered a similar low-carbonation fate. Another thing to consider is hoppy beers, even hoppy stouts. In particular, Victory Dark Intrigue and North Coast Old Rasputin XIV take on a big faded hop character after about a year (still good, but very different from when they were fresh). Speaking of Victory, Oak Horizontal was great when I drank it on the day of release... but got super boozy and unbalanced after just a few months. Not sure if that one will come around... Not all Barrel Aged beers suffered from age. Witness The Bruery's Coton (which, true, was only 25% bourbon barrel aged), one of the few beers to earn the coveted Kaedrin A+ rating (after a lenghty 2 year stay in my fridge). The difference, I suspect, is the 14.5% ABV. Pumpkin beers don't seem to work at all. To a lesser extent, spiced beers also seem to fade quickly after a certain point, though they have a good year in them (Anchor's Christmas Beers are always worth trying after a year). Pumpkin beers, though, do not. Even something like Cape Ann Fisherman's Imperial Pumpkin Stout, a 10% ABV stout, doesn't do so well after just one year. The Bruery's Autumn Maple, while superb when fresh, did not hold up so well to aging. To be fair, perhaps my aging conditions were not ideal for these brews, but I still say drink your Pumpkin beers fresh. Barleywines are a bit of a mixed bag for me. They're usually good, but extremely hoppy varieties tend to feature a strong faded hop component. This isn't necessarily a bad thing, and it works well enough most of the time. English style Barleywines (like this High Water Old And In The Way, which had a year or so on it when I tried it) tend to fare a little better than the American style barleywines, which can be good too, but again, they tend to have a big faded hop component. On the other hand, really high ABV could make up for that. I'd be curious about something like Bolt Cutter, for instance. 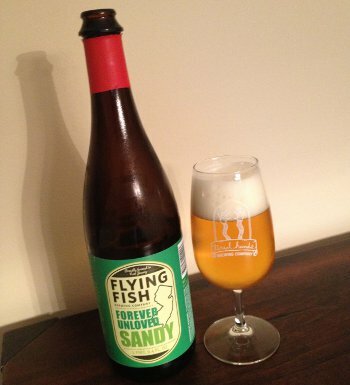 But I'd drink something like Flying Mouflan (a relatively svelt 9% ABV, and very hoppy too) while fresh. The jury is still out on funky beers and sours for me. I've heard that these keep for a really long time, but from what little experience I've had, I'm guessing their character changes significantly. Baudelaire iO was fantastic fresh, and still really good with a year on it, but I think I prefer the fresh stuff. I really wish I got to try Broederlijke Liefde when it was fresh, because it felt a bit unruly, but who really knows? 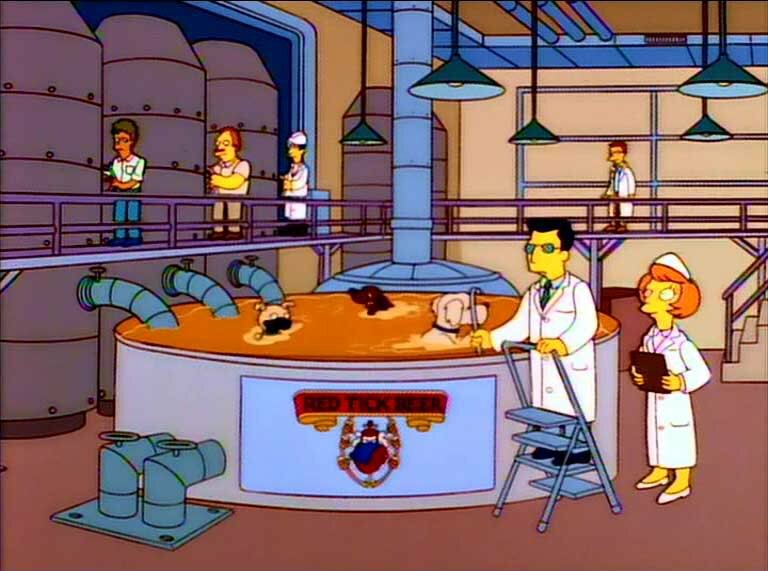 The short story here is that most beers are probably best drunk fresh. Aging is a bit of a crapshoot except when you hit reallly big beers like World Wide Stout or Samichlaus. It's really cool when aging something does work out, so I feel like it's worth playing in this realm, but if you just bought a beer that you've never had before and are wondering if you should lay it down for a while, I'd probably just crack it open right now. If you like it, pick up another bottle and age that to see what happens. I know, that requires foresight, which is lame. I'm bad at it too. I'll have to go through my cellar and catalog some of the stuff I'm intentionally aging (or, uh, unintentionally aging), but I'll save that for another post. Or not. But then again, things do get weird up in New Hampshire and they have to do something to keep up with their neighbors in Vermont. You never know. Beer Nerd Details: 10.4% ABV bottled (22 oz bomber). Drank out of an Only Void snifter on 7/27/13. Bottle conditioned in 2013. Last year, I sent a bottle of this stuff over to Jay, and he seemed to really enjoy it. Me, I'd be really curious to see what age does to this, a topic I should really revisit sometime soon. Hey, maybe tomorrow. Stay tuned. I'm not generally one for the pomp and circumstance of serving beer. Maybe it's just because the most elaborate process I've seen is the ridiculous 9 step ritual for serving Stella Artois. That's a lot of work for very little payoff, if you ask me. So anyway, whilst perusing the beer menu at a local establishment, I spied some of that prized Cantillon Fou' Foune and went in on a bottle with some friends. Now we all know Cantillon's stellar reputation, but the hype surrounding this particular loon (a lambic made with apricots) goes well beyond even that. It cost a pretty penny too, but that's softened somewhat by splitting the bottle (that being said, if you can find it, ordering direct from Belgium and paying the obscene shipping would probably work out to a similar price) and we were pretty happy to ritualize the tasting of this stuff. Beer Nerd Details: 5% ABV bottled (750 ml capped and corked). 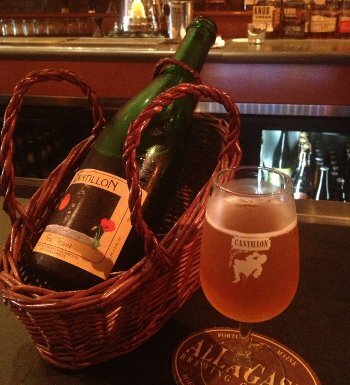 Served from a lambic basket to a Cantillon flute. I would have taken better notes, but then, I was trying to be social and felt bad enough scribbling in shorthand into my phone for a minute. Anywho, it's been a pretty fantastic few weeks here at Kaedrin. Things will likely not remain so exciting, but stay tuned, there's lots of fantastic beer on deck here at Kaedrin HQ, and a potential Vermont trip in the near future may result in more fun. 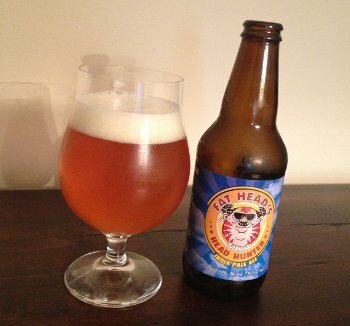 I have a friend who has a really large head, but it pales in comparison to the fat head that represents the logo for Fat Head's Brewery. I have to admit, I initially find that bulbous looking thing a bit of a turn off, but they seem to have fun with the logo and you know, he seems happy. Even jolly! And as we all know, it's what's inside the bottle that really counts, so let's take a closer look at this Ohio brewery's wares. I was fortunate enough to procure a few Fat Head's beers thanks to a friend who was visiting the great state of Ohio (my army of mules is growing). Beer Nerd Details: 7.5% ABV bottled (12 oz.) Drank out of a tulip glass on 7/20/13. Bottled 6/05/13. Pop quiz, Don Quixote: You've got a 2 year old bottle of small batch imperial stout from the Netherlands... what do you do? WHAT DO YOU DO? Beer Nerd Details: 10.2% ABV bottled (11.2 oz waxed cap). Drank out of a snifter on 7/13/13. 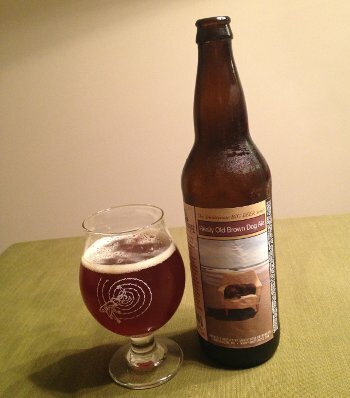 Brewed on 07 March 2011. Bottled on 11 April 2011. Bottle Number 10 (of 2080). I would say that maybe this is my fault for hanging on to the bottle for a while before opening it (in fairness I did purchase it about 6 months ago, so it's not like I've been holding on to it for the full 2 years), but on the other hand, the label sez "This Ale will be good for 25 years if kept cool and dark", so I was lowballing it. De Molen seems like a quality little Dutch brewery though, and if my wallet can handle the strain (and this is expensive beer), I'd like to try some more of their stuff.